Griffin Technology should be a name that a fair number of us are familiar with in this day and age especially when you take into consideration the number of thoughtfully designed mobile accessories that the company has come up with in the past. Having said that they have just announced the spanking new Griffin WatchStand, which so happens to be the company’s maiden outing when it comes to rolling out a new range of peripherals for the recently announced Apple Watch. 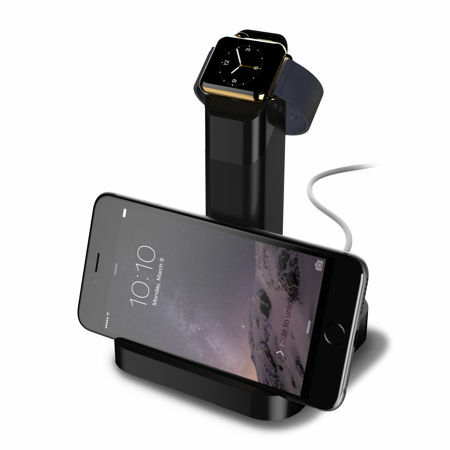 The Griffin WatchStand would be a simple yet elegant charging and display dock that delivers a safe, secure place for you to juice up your Apple Watch even when it is not being worn. There is definitely no doubt about it that the Apple Watch will usher in the next generation of wearable technology, and Griffin intends to remain ahead of the pack in this matter by gaining first mover advantage at least among the more established names and players that are in the market. The WatchStand will show off your brand new Apple Watch on a sleek pedestal, where it can be placed just about anywhere on any nightstand, tabletop or desktop for convenient daily charging. The Griffin WatchStand itself houses the Apple-provided MagSafe charging cable in an angled cradle which will ensure that it is ready to charge all the time. Initial assembly will require the user to feed the MagSafe cable through the center of the post, where one can then charge each day by laying the Apple Watch against the cradle. The MagSafe connector’s magnet will then gently snap itself onto the back of the watch and kick off the charging process. This extremely versatile WatchStand will play nice regardless of the version of the Apple Watch that you would pick up, as it holds it at an easy viewing angle as it charges. Capable of accommodating both semi-flexible and fully flexible bands, the WatchStand will then securely display and charge the Apple Watch regardless of whether it is done in a vertical or horizontal manner. You will only be able to get your hands around the Griffin WatchStand later this summer for $29.95 a pop.